Reviews to products linked, others coming soon! Origins Out of Trouble Mask, Juicy Couture Viva La Juicy*, Tresemme Liquid Gold*, Estee Lauder Advance Night Repair*, Ebay Eyelashes, Fix +, Benefit The Porefessional, YSL Faux Clis, Collection 2000 Shimmer Shades, Makeup Forever HD, Illamasqua Androgen Cream Pigment, St Moritz Tanning Mousse in Dark and Medium. I thought I'd get on the blogger band wagon of doing monthly favourites, I'll try and do one every I tend to stick to the products I like and tend to stick with brands I know. 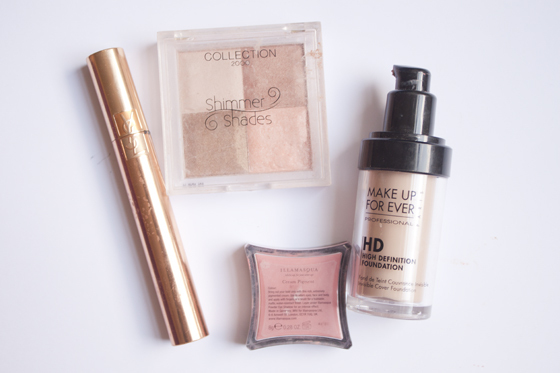 This month I've been loving glowy cheeks, fake tan and big lashes! 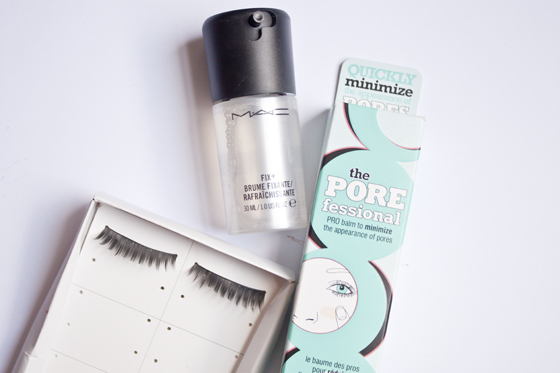 I finally bought a new Benefit The Porfessional, as its my favourite primer of all time. I can't honestly live without it, its one of those products that is 100% worth splashing out for. Viva La Juicy is my currently favourite perfume as its sweet and girly, probably a bit too much for some people but I love it! I can't speak highly enough of the Origins Out of Trouble Mask, I've been using it twice a week since I bought it. I've found overall my skin has cleared up well and has helped minimise my breakouts. Im going to try and review it as soon as I can! If you want to know anything specific about an item just let me know in comments! I have linked to the reviews of the things I have done already, and the rest are coming soon! Viva La Juicy is my current favourite perfume too! i definatly need to try the porfessional, its everywhere i look! 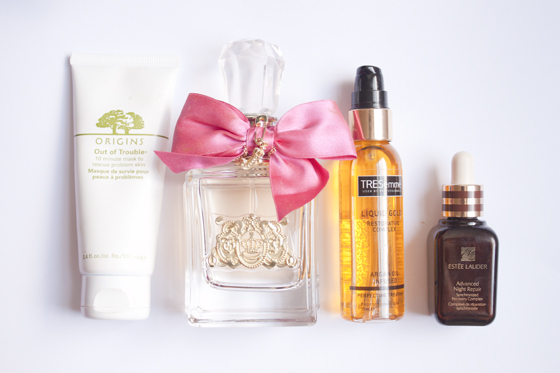 Advanced Night Repair is in my March favourites too! Yes and No, Its good if you wear a lot of powder and don't want to look cakey, I don't think my makeup lasts longer by using it it just sort of "refreshes" it after I've been wearing it a while. I use it when I apply my MSF natural, spray my whole face leave to dry and then put a fine dusting on top! i have 115, its the same colour as my natural skin tone but i bronze up with it! oh i have those ebay eyelashes and theyre such a bargain for the amount you pay! they can be a bit of a bugger to get on as theyre so straight, but wrapping them around a brush for a few minutes makes it easier! what number ebay eyelashes are they? they look nice! I don't know sorry! The ones I've linked are the ones I normally buy from! I'm not sure sorry, on my press release it days middle of march but I've not heard anything else from the brand yet! I have normal-combination skin (a few dry areas and a few oily areas) and was wondering if the Origins mask would be any good for me! viva la juicy is my current perfume too! I need to restock the porefessional...I've definitely noticed the difference after I ran out of it! I really want to try Benefit's Porefessional but the price tag is a little crazy for me. Really need to try the Liquid Gold - dry ends be gone! Your hair always looks amazing so I'm sold on anything you suggest. 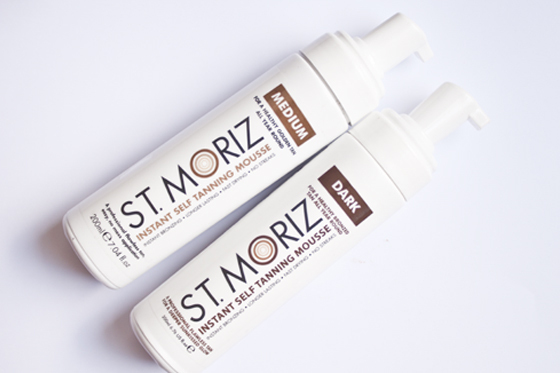 LOVE THE HEAR MORE ABOUT THE TAN.